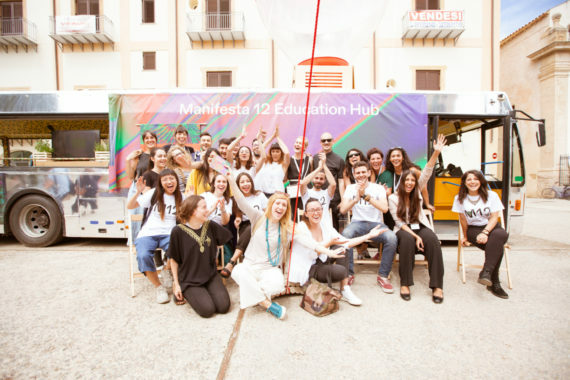 During my visit to Manifesta preview I concentrated on looking into the work undertaken by the Manifesta education department. 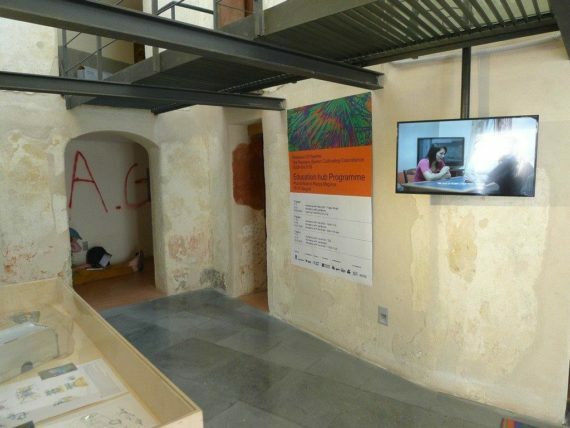 I often work on participatory projects with outreach, learning and education departments of museums, art organisations and galleries in the UK while in Palermo I wanted to see how engagement and learning function within the structure of a nomadic biennial that every two years establishes connections with new audiences in new locations. I attended an Education Hub opening event, attempted a tour with one of the Manifesta 12 Gardeners, visited an exhibition area showcasing the pilot projects and documentation of works developed by the education department in the lead up to the biennial, toured the city with the social innovation map in my hand and had a conversation with Yana Klichuk, Head of Education and Learning of Manifesta 12. Part of this research took the form of a three day journey through the neighbourhoods of Palermo during which 150 people expressed their views about their city. This resulted in a short film that was labelled controversial due to its focus on stories from poor neighbourhoods, showing the non-glamourous parts of the city, hand to mouth existence of its inhabitants, separation from the centre, Mafia’s influence and pollution of the sea. The socio-cultural mapping supported the development of some of the projects commissioned for the biennial, for example a project by Gilles Clement and Coloco in the neighbourhood of ZEN. A number of pilot projects took place in schools and nurseries across Palermo. One of the projects led to a follow-up outside the schools. A musical “Rhyming Memories – Magiona Community Project” was created by a group of young people working with a local rapper and social worker. The group attended by the pupils of Ferrara school, situated on Piazza Magione concentrated on the exploration of the history of this piazza, a large square at the heart of Palermo just by the Manifesta hub at Teatro Garibaldi. The film about the project can be viewed on a screen in Teatro Garibaldi. The research uncovered that many people rarely leave their neighbourhoods and very occasionally visit the city centre where almost all works commissioned by Manifesta 12 are presented. The education department did not want to focus their efforts only on city centre dwellers and developed a mobile Education Hub designed by students from the University and the Academy of Fine Arts of Palermo in collaboration with ENORME studio, an architecture practice from Madrid and the AMAT public transport company that travels the neighbourhoods during the biennial. An old disused bus was transformed into an indoor-outdoor space full of bright colours and busy patterns created specifically for the bus by Fallen Fruit, M12 artists. (They were among the artists who collaborated with the education department and conducted their workshops at the Hub during the opening days.) 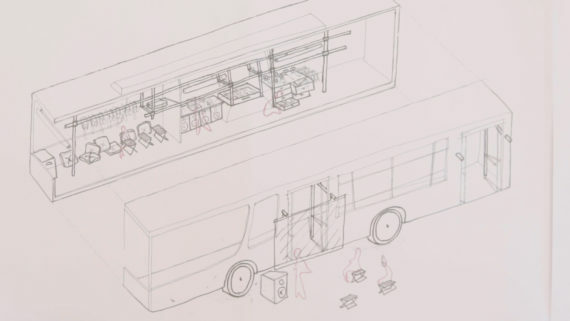 The bus also includes a dedicated hang out space and clever storage for materials. This is a far cry from the usual ‘room with tables and chairs’ known within traditional spaces of education departments. The idea of a travelling bus is not a new engagement strategy. It is a development for Manifest that for example had a mobile dacha during biennial in St Petersburg. But the roots of mobile platforms go at least as far as the community arts movement. Buses as mobile engagement spaces were used for example by Jubilee Arts in the Black Country, UK in the seventies and eighties. A visit to an exhibition can be accompanied by a tour with the gardeners, a dedicated team of eight trained mediators who lead group walks around the venues with the aim, not to show and explain, but to foster conversation and debate between all people attending – the model influenced by the radical pedagogy of Paulo Freire. “Manifesta 12 Gardeners act as caretakers, cultivating the coexistence of visitors’ opinions around the event”. I signed up for one of these walks only to discover that they would be led in Italian during the preview days. During a conversation with Yana Klichuk she underlined the importance of working with mediators. In her view the real legacy of the biennial stays with this group – highly trained, dedicated, passionate, often young people who tend to be local and have invested in their area. Once the biennial moves to a new location it is mediators who often remain, joining grass roots or established organisations, developing their own projects, continuing the education work and challenging the status quo. I spent a day navigating the city on foot with this map in hand and it took me to small community gardens, places of calm and greenery in the busy city, churches that host workshops for families, canteens where you can eat delicious food cooked by refugees. These pockets of activity will remain when Manifest is long gone. And yes, there are other maps you can pick up in Teatro Garibaldi, showcasing the main programme and collateral events. In order to ensure that the kit finds its audience and that teachers will be interested in working with it the education department found a way for training, exploring how to use the kit, to be accredited. Ensuring that the training is recognised as professional development for teachers led to much interest and showcases that embedding learning into existing structures may bring better results than when it is extracurricular. My conversation with Yana Klichuk revealed familiar pressures frequently experienced in the British landscape where for example education departments are seen as being in the service of the ‘main exhibitions programme’. The department’s achievements are showcased for the benefit of sponsors and funders but not seen as critical and pressing matters when colliding with ‘main commissions’. The education department has built relationships with artists based in Palermo, offered them paid opportunities and recognised them as practitioners. Not one Palermo based artist has been commissioned to be part of the ‘main programme.’ (There are two Palermo-based non-artists participants – writer Giorgio Vasta and architect Roberto Collovà.) This again echo situations known to me from the UK where ‘local artists’ rarely get to exhibit their work in prime spaces of the venues closest to their home and education departments are the ones fostering these local connections. The act oscillating between recognition and pacification. The films documenting the pilot projects developed by the education department play on a single screen. Documentation of the Education Hub as well as the Education Kit are displayed in the glass top cabinets. All these works are on show in a corridor area of Teatro Garibaldi, near the toilets and in the threshold to the main space, where ‘commissioned art’ is located. I only managed to find it on my second visit as the glass tops were used during busy preview days as rest spaces for bags and rucksacks by people queueing for the toilets. No invigilators present. Again dedication of this non-space, through-space, walk-way made me think of many exhibitions of works commissioned by education departments in the UK that I experienced in spaces otherwise known as staircases, corridors and landings. Building networks and connecting people is important for Klichuk, who would like to leave Palermo in a stronger place. Social Innovation Map showcases and recognises a number of initiatives across the city, places them in urban landscape and makes them visible. The education department is working towards an event in Autumn 2018. It will take place on the 19-20th of October, and will bring together three perspectives: Palermo (including Manifesta experience), national (various cities of Italy) and Marseille (bridging with the research for Manifesta 13). The full details of the event will be announced in coming weeks but it will offer further opportunities for Palermo based initiatives to be visible and to connect to organisations in other parts of Italy and Europe. Klichuk’s observed that Palermo and Sicily suffer from islanders’ mentality and often underestimate the importance of international connections and networks. Again an observation that would sit comfortably with some of the approaches that I experienced whilst working in the British Isles. * All quotes from M12 Education: Methodological Notes on Integrated Research; Editor: Micaela Deiana.